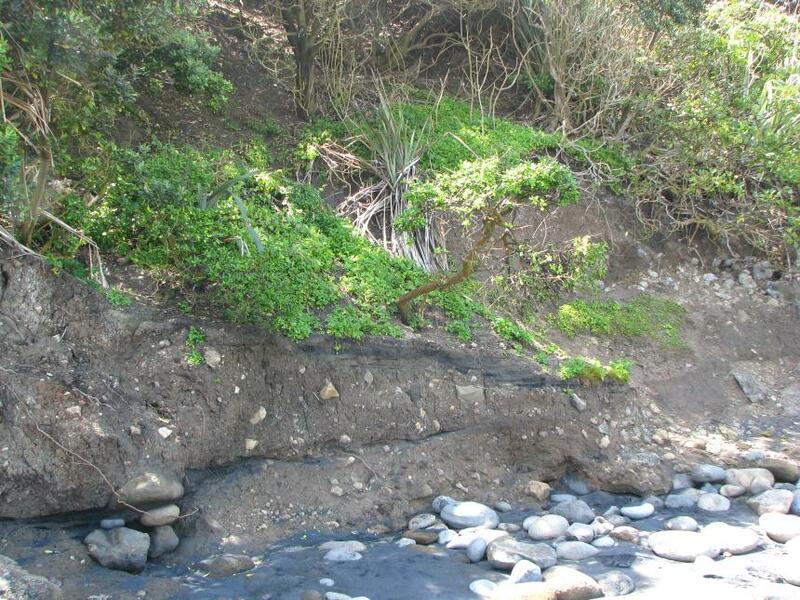 This endemic fly is widespread around the coast of New Zealand and on many off-shore Islands. 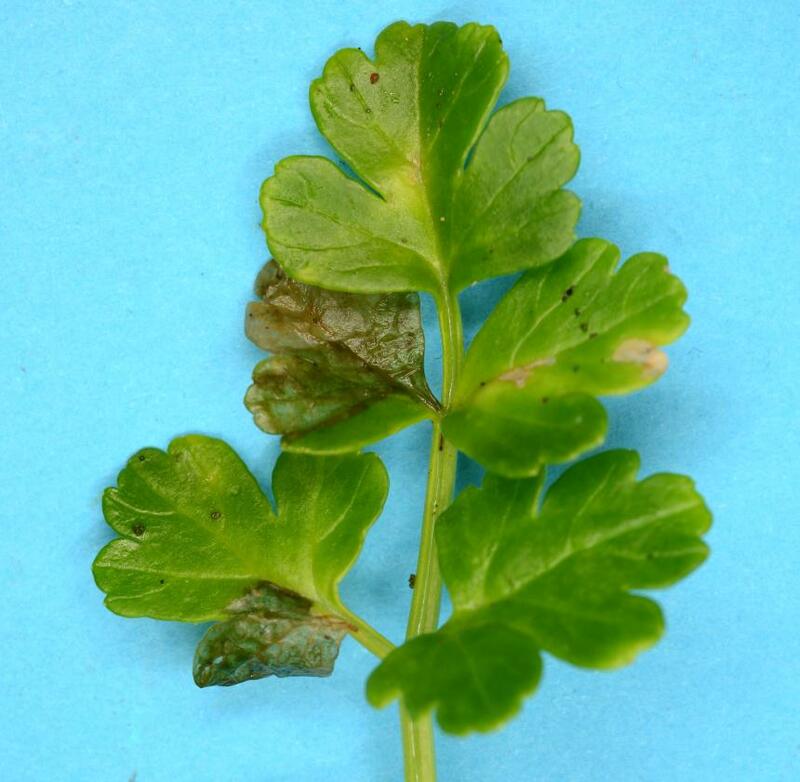 It was recently found to live on decaying and live leaves of New Zealand Celery, Apium prostratum (Umbeliferae), a plant with a coastal distribution. 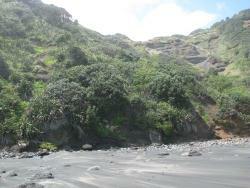 Conservation status: widespread around the coast of New Zealand and on many off-shore Islands, not threatened. 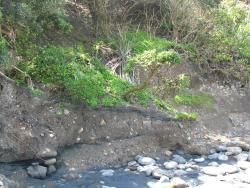 The Coastal Scaptomyza fly breeds all year on its host plant, New Zealand Celery, Apium prostratum (Umbeliferae). The eggs are laid on or by decaying leaves. 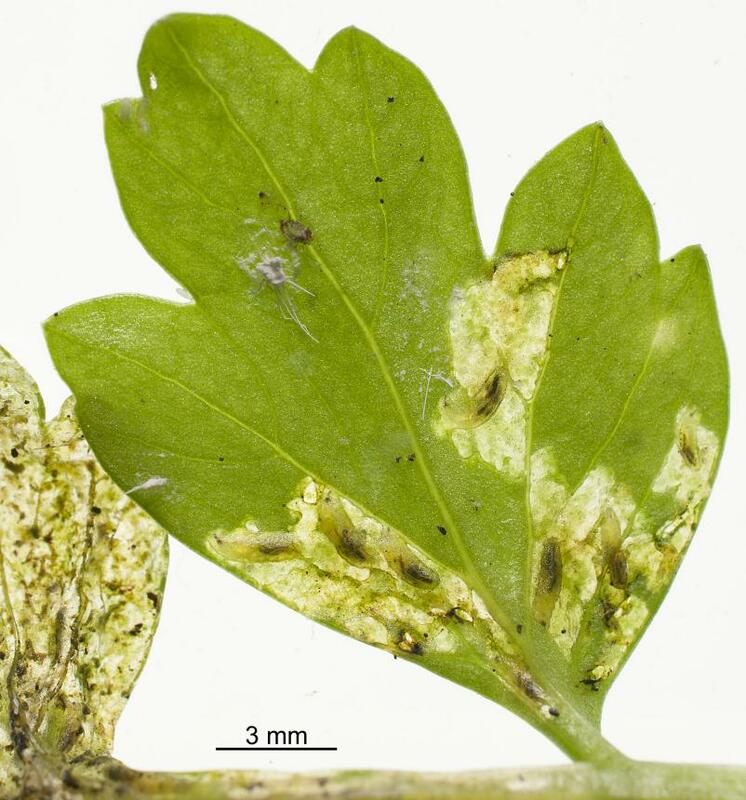 The decaying leaf tissue may be due to old age or feeding on young leaves by caterpillars of Merophyas sp. (Lepidoptera: Tortricidae). 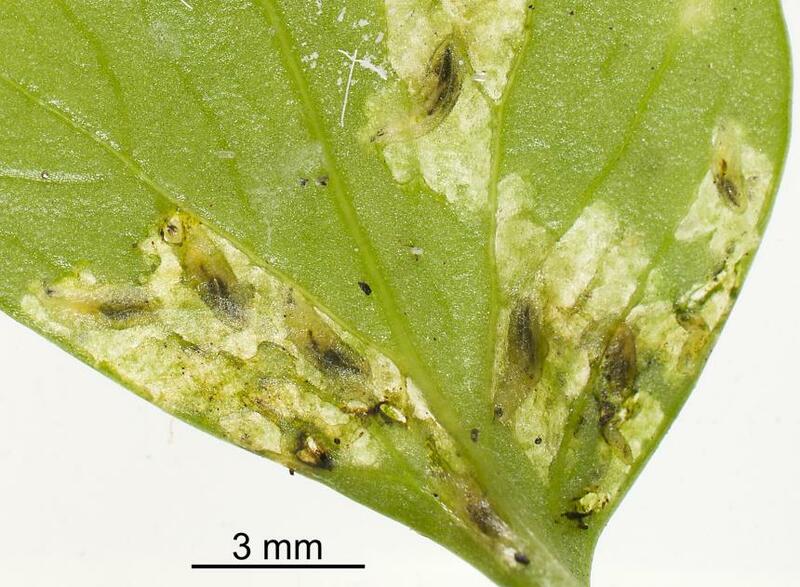 First instar (stage) larvae only feed on decaying leaves, which the older larvae may feed and complete development on either dead or live leaves. This species is thus a facultative leaf miner. 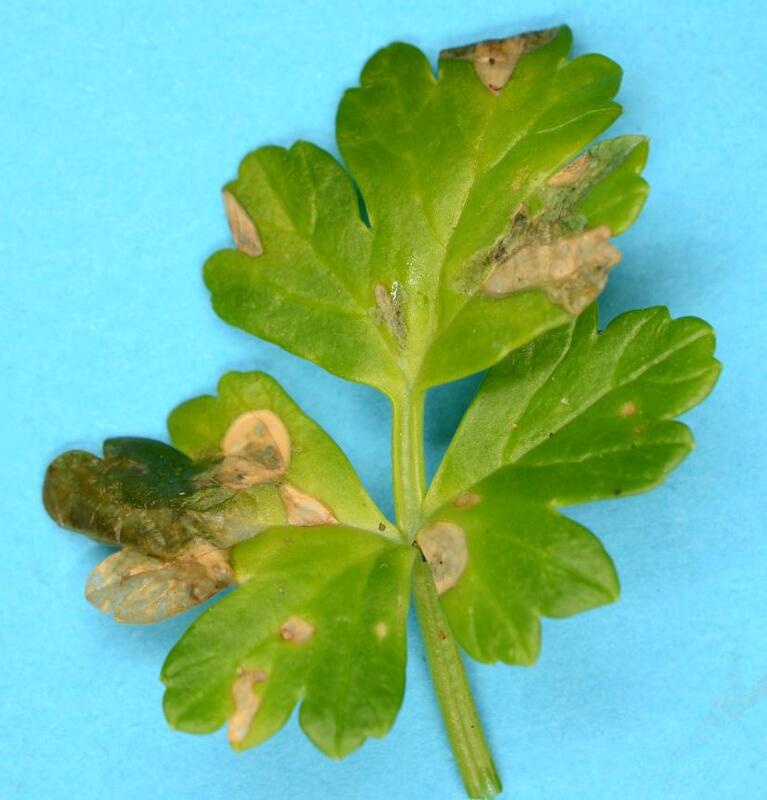 The adult flies feed on flower nectar and on juices of decaying celery leaves. 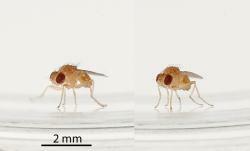 The yellow-brown bodies of adult flies are small, about 2.25-3-00 mm long and wings are also 2.25-3.00 long. The flies are smaller than vinegar flies, Drosophila, that are seen around rotting fruit. The adults are typical flies, having one pair of wings. The hind pair of wings is reduced to two small knobs, or halteres, which help the fly to balance during flight. They also have three pairs of legs. The two antennae each have a plumose arista, which is typical of Drosophilidae in New Zealand. Both the male and female have a rounded end to the abdomen. The male has the more complex external genitalia. 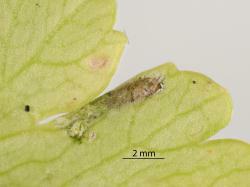 After mating the female lays eggs on or near decaying celery leaves. 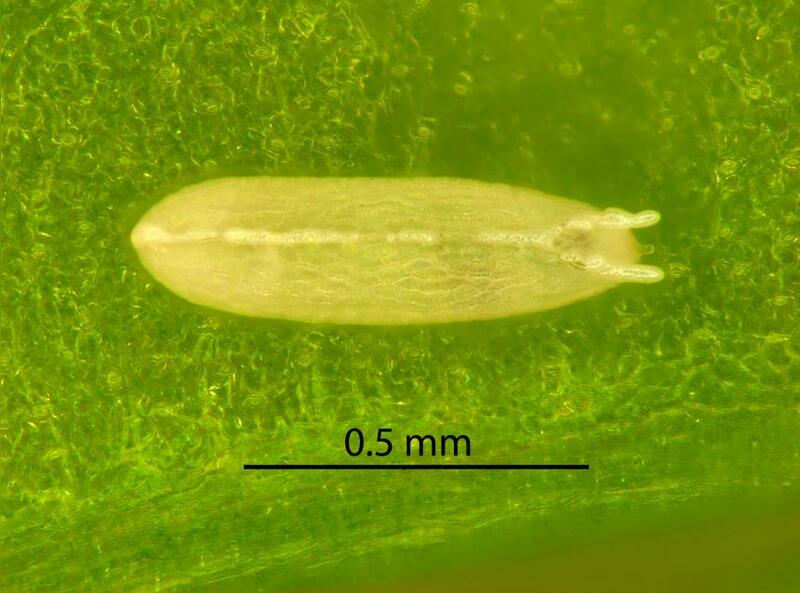 The pale coloured egg is less than 1 mm long. Its upper side has a long ridge that forks at one end with both branches forming short projections. 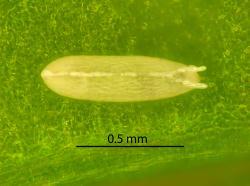 The surface of the egg is finely sculptured. The larva is a small pale maggot that feeds on decaying celery leaves. When the first instar (stage) larva is fully grown it moults, changes skin, into the second instar. There are probably three instars. The larvae have a dark toothed mandible supported by a short strong skeleton. The mandible moves from side-side and scraping the dead or live leaf tissue that is ingested. The fully grown larva is about 3 mm long. The fully grown larva may stay in a leaf mine or in decayed leaves. 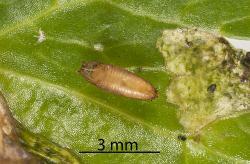 The larva pupates inside its larval skin, which turns dark brown and hard. This structure is called a puparium. The puparium has a pair of stigmata (organs for breathing) at each end of the body. The anterior, front, pair of stigmata protrude from the leaf mine of the wet decayed leaves. 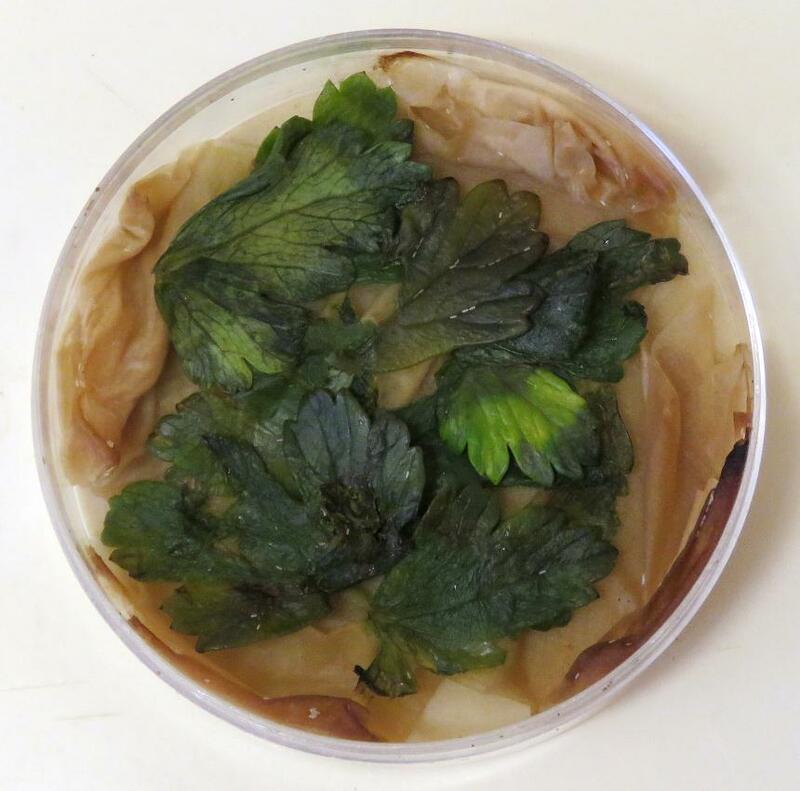 Several puparia of Coastal Scaptomyza fly, Scaptomyza flavella (Diptera: Drosophilidae) in a dish where they were reared on rotting leaves of New Zealand Celery, Apium prostratum (Umbeliferae). 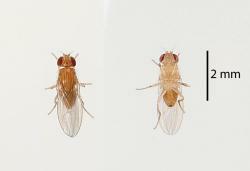 The larval habit of the Coastal Scaptomyza fly, Scaptomyza flavella (Diptera: Drosophilidae), and its damage to its host plants is distinctive. 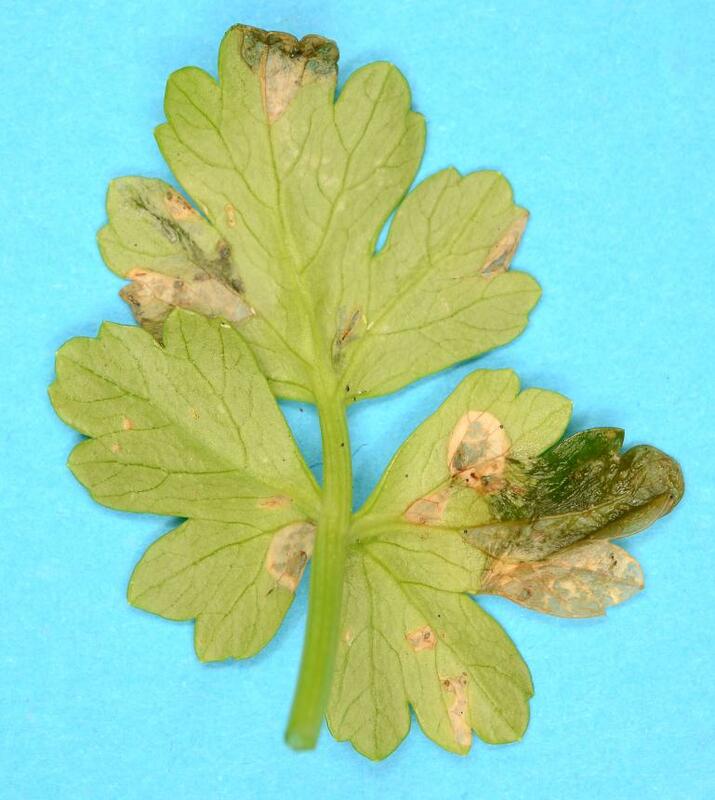 This is the only fly known to form leaf mines in New Zealand Celery, Apium prostratum (Umbeliferae), though other fly larvae live in decaying celery leaves. 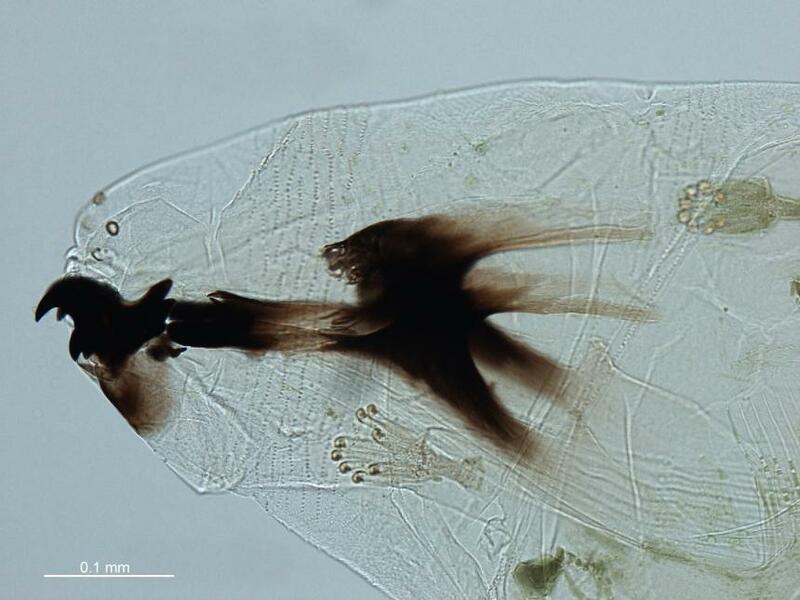 However, the Scaptomyza larvae have a distinctive toothed mandible and short supporting skeleton. 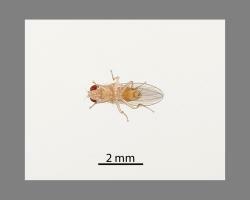 The adult flies are a little smaller than vinegar flies, Drosophila species. (Drosophilidae). 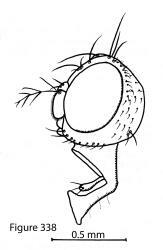 Like Drosophila species they have a plumose arista on the antennae. They are one of four species of Scaptomyza that have only two rows of acrostichal setae on the mesonotum (visible segment after the head). 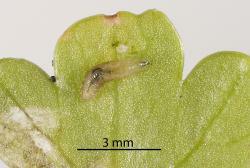 The tiny acrostical setae are found in near the centre line of the mesonotum. 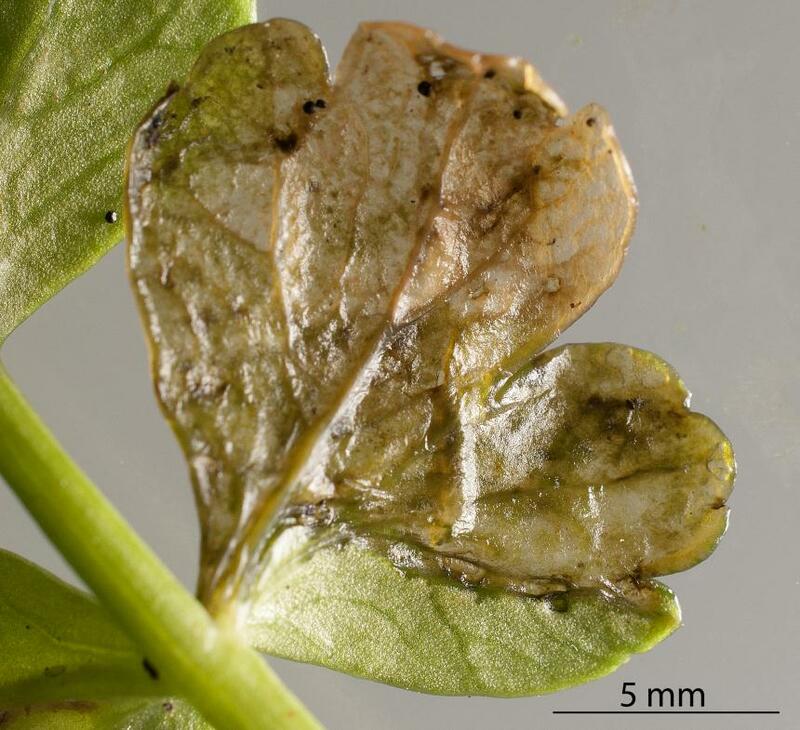 The flies are darker on top than underneath, but the colour on top is uniform, whereas the other coastal Scaptomyza species, the New Zealand Spinach leafminer has a darker abdomen. 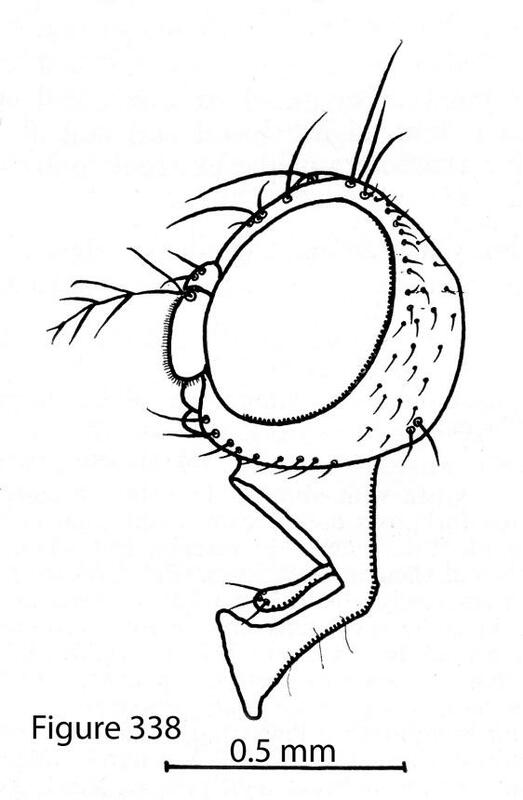 Drawing of the side of the head of Coastal Scaptomyza fly, Scaptomyza flavella (Diptera: Drosophilidae): note the plumose arista on the antenna. Image: RA Harrison © Drawing published in NZ Department of Scientific Research and Industrial Research Bulletin 128, Figure 338. 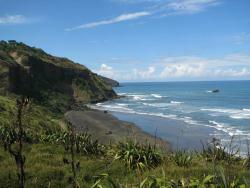 There are no reports of any pathogens, parasitoids or predators of the Coastal Scaptomyza fly. It is likely that they are preyed upon by birds, spiders and predatory insects and parasitised by one or more species of wasp. 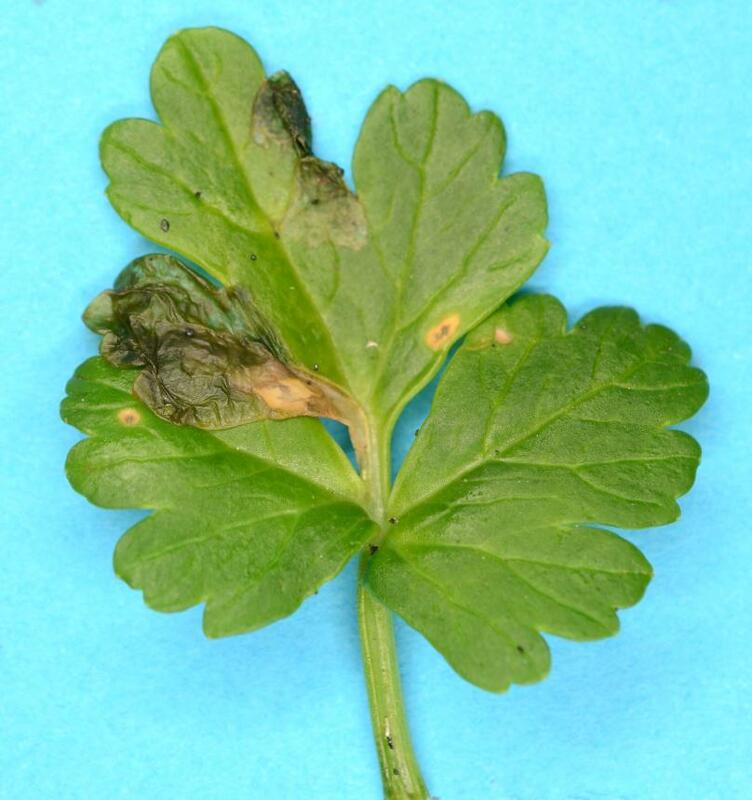 The Coastal Scaptomyza fly breeds all year on its host plant, New Zealand Celery, Apium prostratum (Umbeliferae). 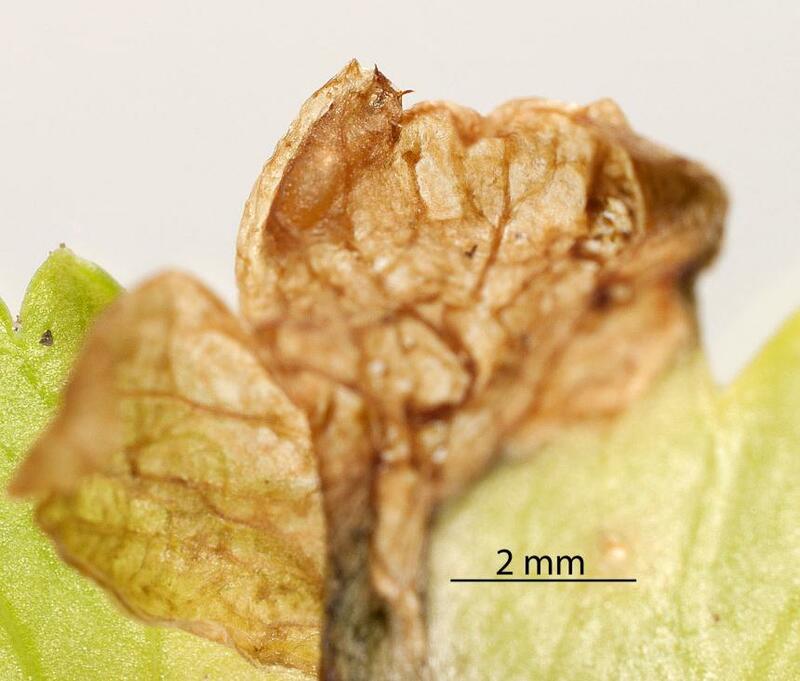 The eggs are laid on or by decaying leaves. The decay may be cause by old leaves rotting or by caterpillars, Merophyas sp. (Lepidoptera: Tortricidae) that tunnel into younger leaves. 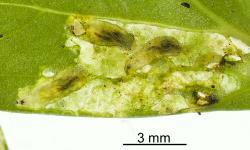 The first instar (stage) larvae of Coastal Scaptomyza fly cannot burrow into live leaves but only decaying leaf tissue. 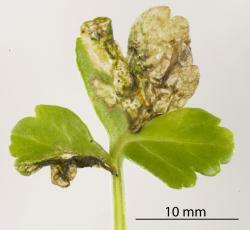 Older larvae can burrow into live leaves and form large blotch leaf mines. The older larvae can also complete their development in decayed leaves. This species is thus a facultative leaf miner. So far it has only been found breeding on plants growing in the shade of trees. The adult flies feed on flower nectar and on juices of decaying celery leaves. 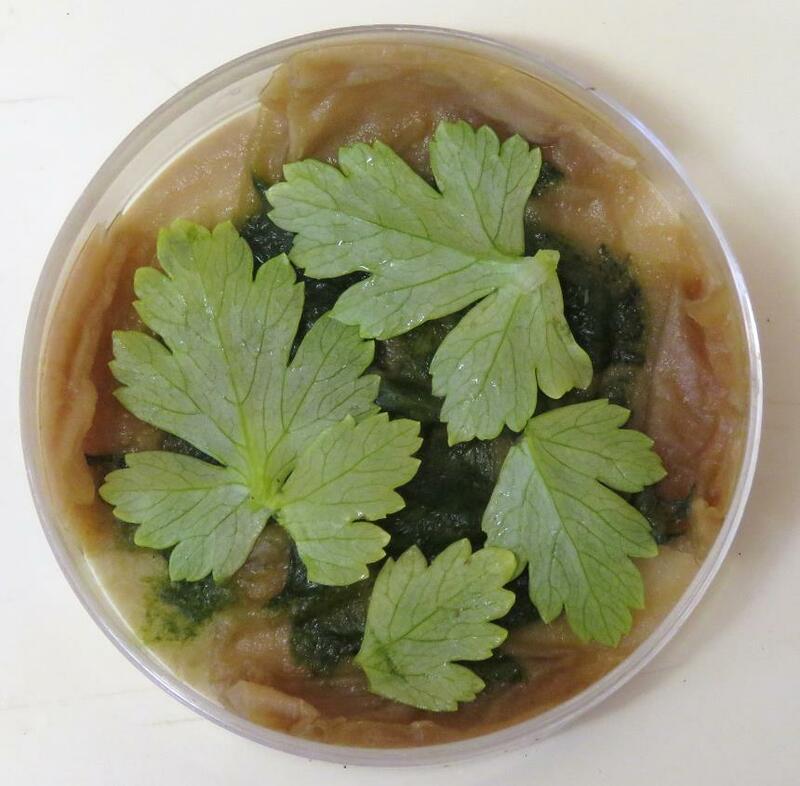 Research Project: How did herbivory start? 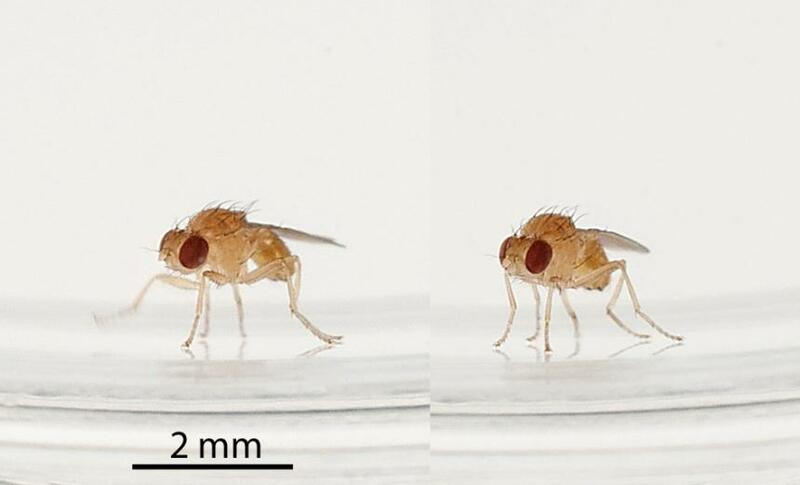 USA research projects have been investigating the genetic changes associated with adaptation of drosophilid flies from a diet of decaying plants to feeding on live plant tissue. For example, how did they overcome the phytochemical defences of plants that help prevent them being eaten. 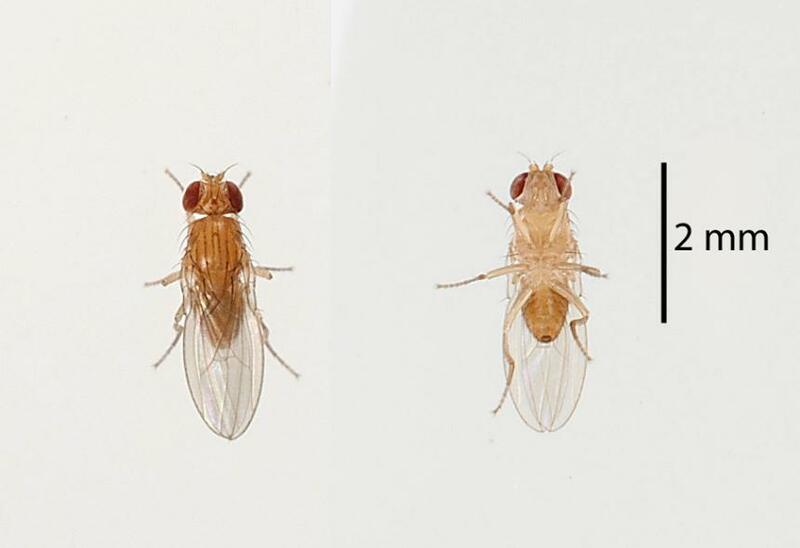 The research team led by Professor Whiteman, have compared the genetic code species of Drosophila which have been studied in detail, with that of Scaptomyza (Scaptomyza) flava, a leaf mining drosophilid. 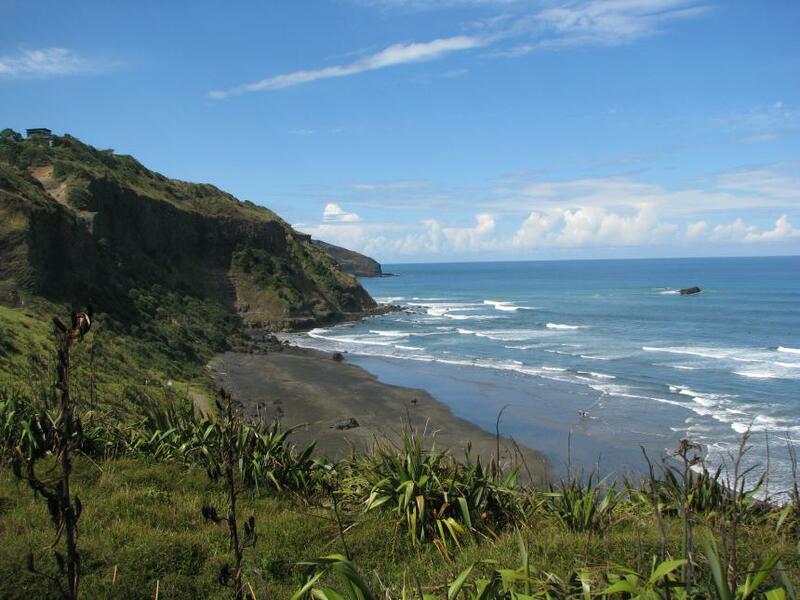 In New Zealand, we have four native species of Scaptomyza, in the subgenus, Bunostoma. 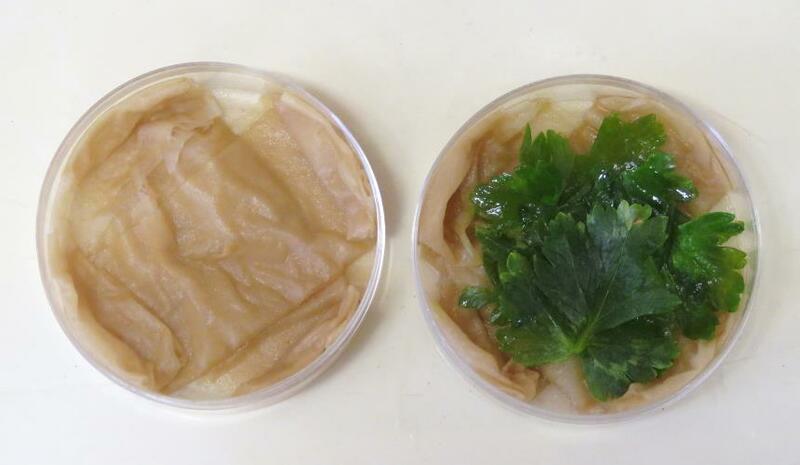 Their habits vary from only feeding on decaying plants to only feeding on live plants with two very different stages in between. 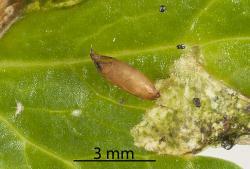 The larvae of Scaptomyza (Bunostoma) fuscitarsis Harrison, 1959 appear to only feed on decaying plant leaves. I have observed one feeding on the outside of a dead leaf of a low growing plant. The first instar larvae of Scaptomyza (Bunostoma) flavella Harrison, 1959 can only feed on dead leaves of New Zealand celery, Apium prostratum (Umbeliferae), leaves, while the older larvae feed on decaying leaves and burrow into and feed on live leaves forming blotch mines. 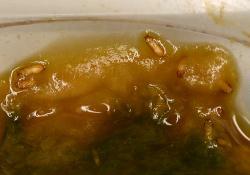 The larvae of Scaptomyza (Bunostoma) sp. 2, a recently discovered species, will feed and complete development on either decaying leaves or live leaves of Tetragonia implexicoma (Miq.) Hook.f. (Aizoaceae). Scaptomyza (Bunostoma) sp. 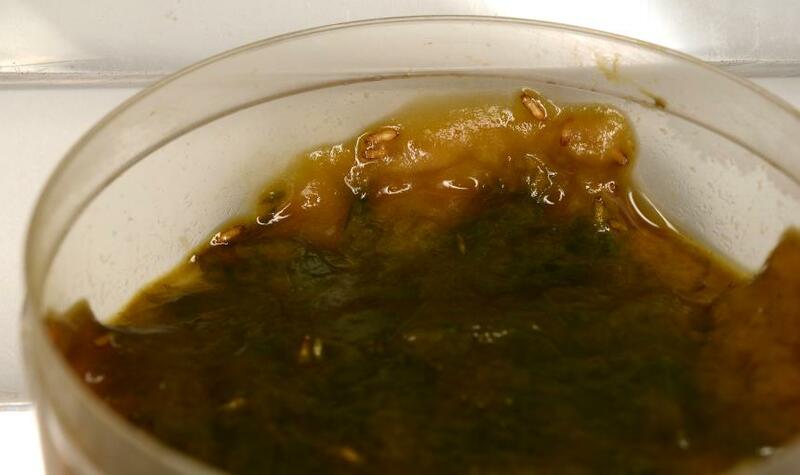 1, was discovered by DSIR entolomogist, Brenda May, who reared adult flies from larvae that were mining leaves of Pratia (= Lobelia) angulate G.Forst. (Campanulaceae). This species is a true leaf miner and larvae do not feed on decaying leaves. 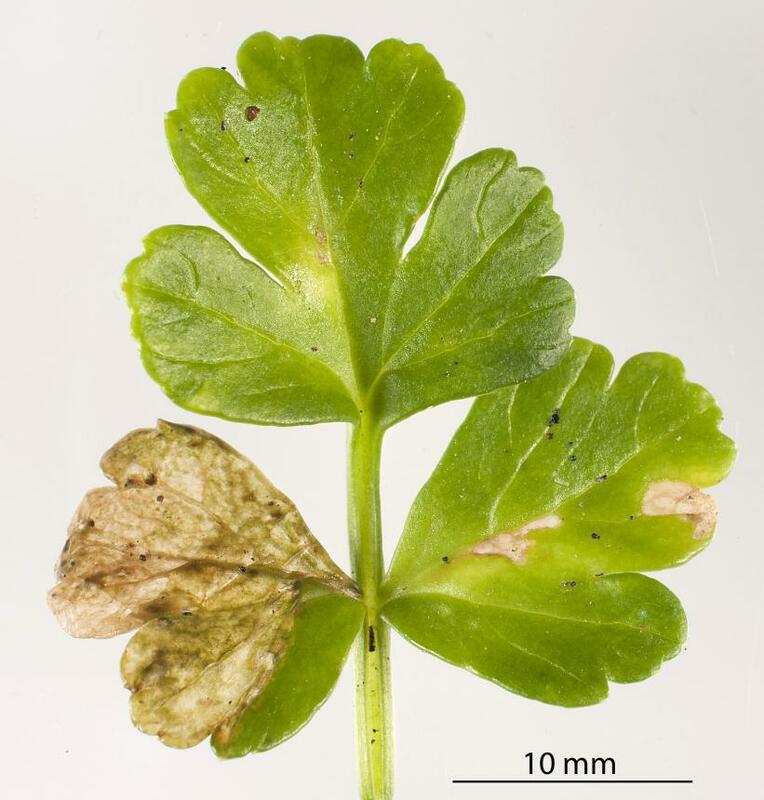 While the host plants of the three species that feed on live leaves are in different families, the plants all grow close to the ground, so that there is close proximity between live leaves and decaying leaves. It is likely that the flies adapted to the phytochemicals in the dead leaves and this allowed them to feed on the live leaves of their current host plant. 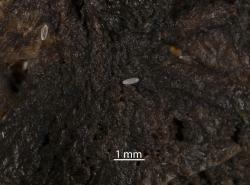 It is noteworthy that the eggs of all three species are very similar and laid on the surface of the plant. 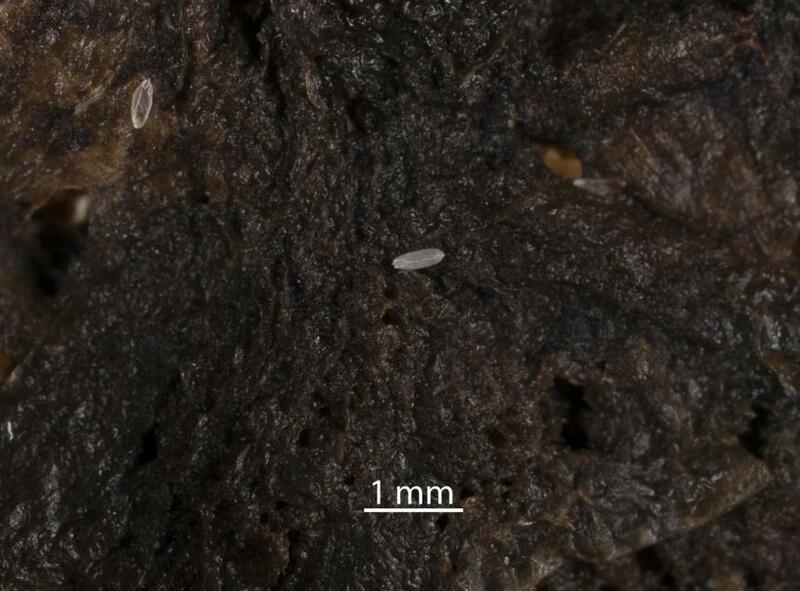 Did the ovipositor found in other leaf mining flies evolve first to puncture the leaf so the adult flies could feed on the sap or to make holes in which to insert the eggs? A study of the genetics of the New Zealand species of Scaptomyza will require the ability to rear the flies in order to produce sufficient specimens. A basic method has been developed and is outlined below. 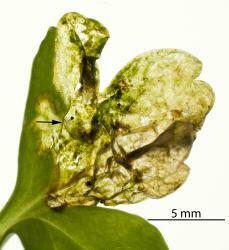 The Coastal Scaptomyza fly breeds all year on its host plant, New Zealand Celery, Apium prostratum (Umbeliferae). 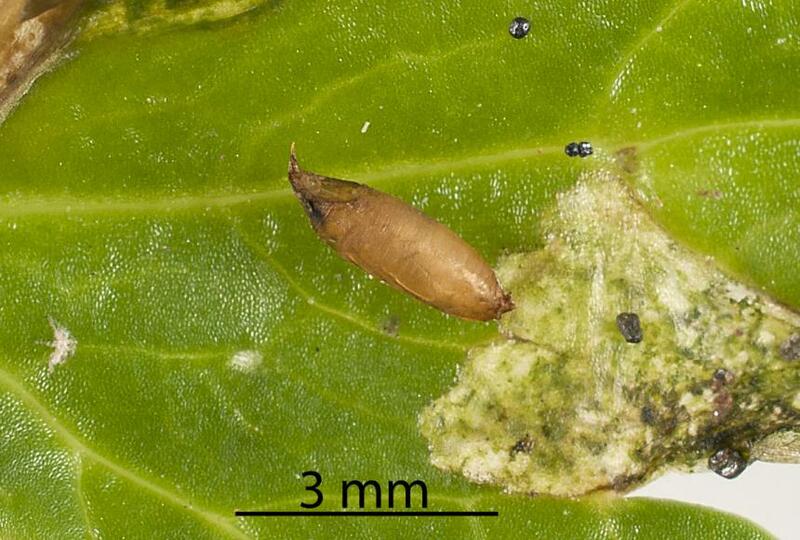 The eggs are laid on or by decaying leaves. The first instar (stage) larvae of Coastal Scaptomyza fly cannot burrow into live leaves but only decaying leaf tissue. 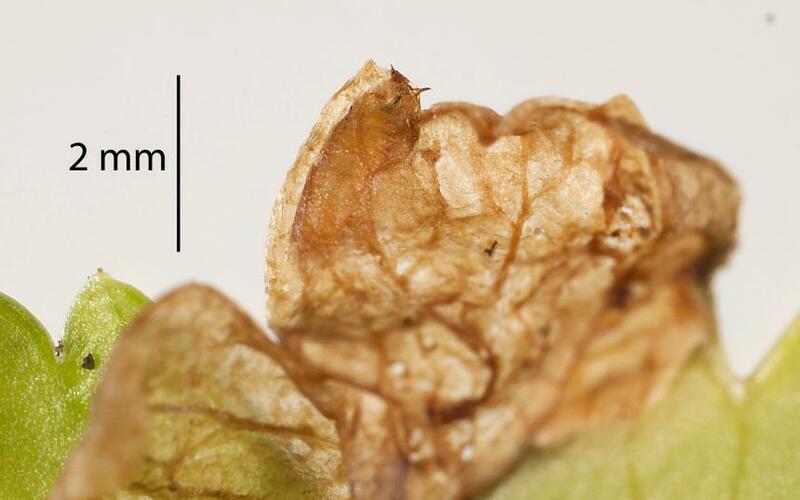 Older larvae can burrow into live leaves and form large blotch leaf mines can also complete their development in decayed leaves. 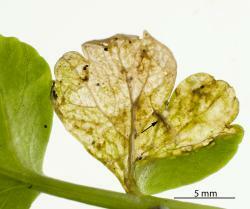 This species is thus a facultative leaf miner. 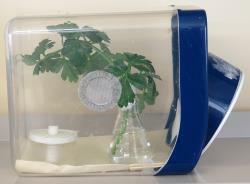 The Coastal Scaptomyza fly can be reared on shoots of its host plant in water in cages with sugar solution for adults. 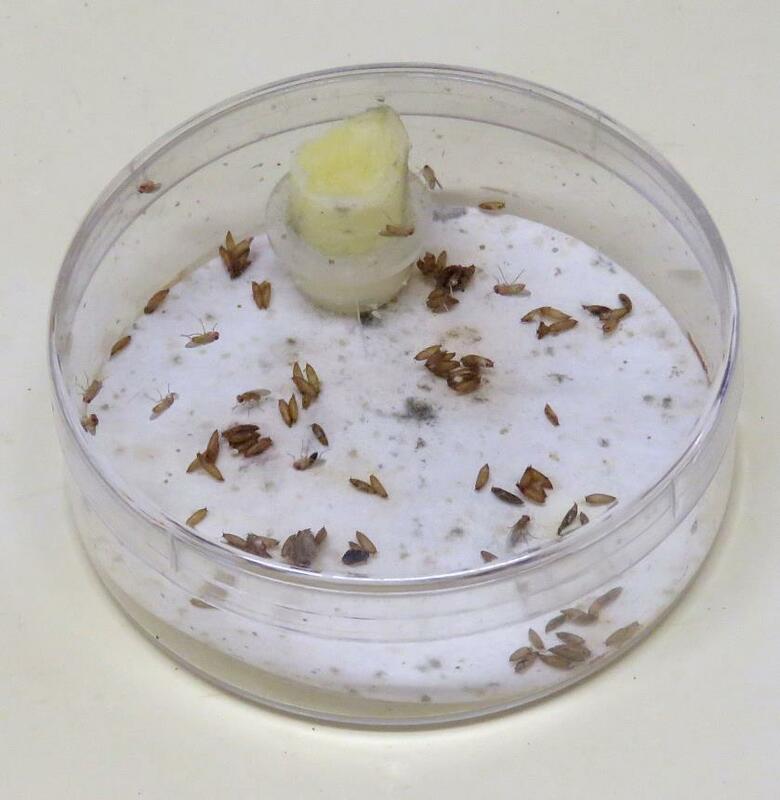 However, this method can be difficult as the shoot has to have a few decaying leaves for the first instar larvae. 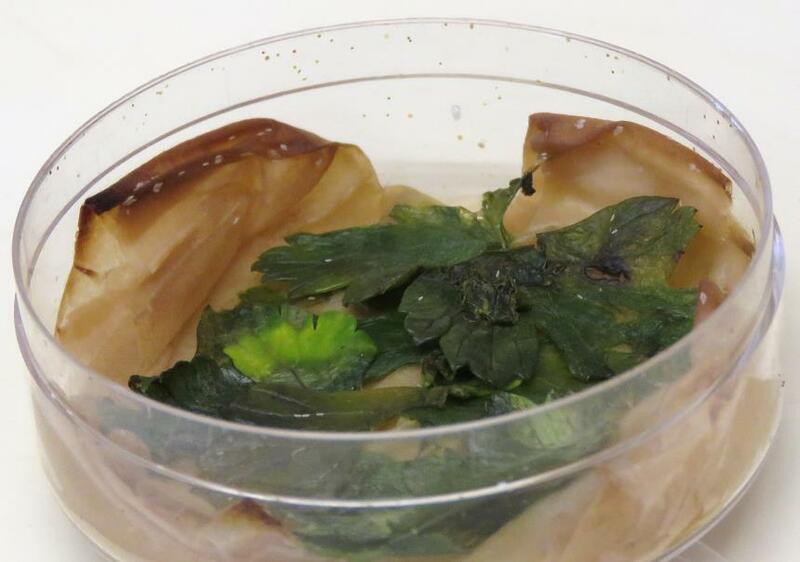 A better method is to use decaying leaves, and juice form decaying plants. Bruised and damaged leaves are kept in a container with a little water. 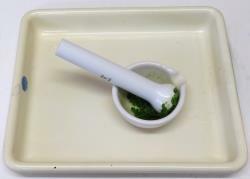 The juice is poured off into a small dish with tissues folded to provide a vertical surface in the dish for the flies and larvae. The surface of the juice soaked tissue paper is covered with celery leaves that have been well bruised in a pestle and mortar. The dish is then put in the cage with the adult flies for 3-7 days. During this time the flies feed on the leaf juices and lay eggs in the dish. After 3 or seven days the dish is removed and replaced. 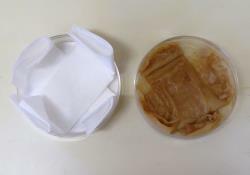 A lid is put on the small plastic Petrie dish and labelled. More celery leaves are added as required. The puparia are removed, counted and transferred to a larger Petrie dish with damp filter paper and a source of sugar solution for the emerging adults. 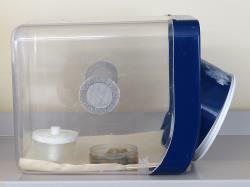 The sugar solution is made by dissolving 20 g of white sugar in 100 ml of hot water. 2-3 drops of yellow food colour can be added. Harrison RA. 1959. Acalypterate Diptera of New Zealand. N.Z. Department of Scientific and Industrial Research Bulletin. 128: 1-382. Martin NA. 2014. Scaptomyza (Bunostoma) flavella (Diptera: Drosophilidae) and the evolution of leaf mining. The Weta. 47: 8-12. Whiteman NK, Gloss AD, Sackton TB, Groen SC, Humphrey PT, Lapoint RT, Sonderby IE, Halkier BA, Kocks C, Ausubel FM and others. 2012. Genes Involved in the Evolution of Herbivory by a Leaf-Mining, Drosophilid Fly. Genome Biology and Evolution 4(9): 900-916. Martin NA. 2017. Coastal Scaptomyza fly - Scaptomyza flavella. Interesting Insects and other Invertebrates. New Zealand Arthropod Factsheet Series Number 94. http://nzacfactsheets.landcareresearch.co.nz/Index.html. Date Accessed. ISSN 1179-643X.